Alright, alright, I'm coming already! Here he is, tonight's special guest star, Danny Maness a.k.a. Danny Madness. If you read the comments section here you already know this guy. I met Danny online years ago, but we've never met in person. Danny's a great writer and musician and you can find out more about him through his blog and listen to some of his great original tunes at his YouTube channel. Okay, enough about Danny, it's time to get a few drinks and search for a swizzle stick in Peoria! Danny was gracious enough to drive to our destination and so just like Neal Cassady and Jack Keroac we are on the road! 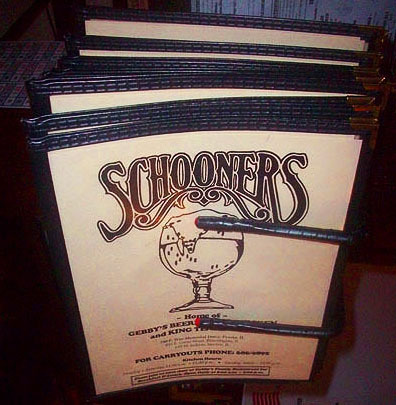 Here we are at Schooner's. I love the rustic look of this place. And nothing says rustic like the wagon wheel out in front of the bar. Let's go in and see what's shaking inside. 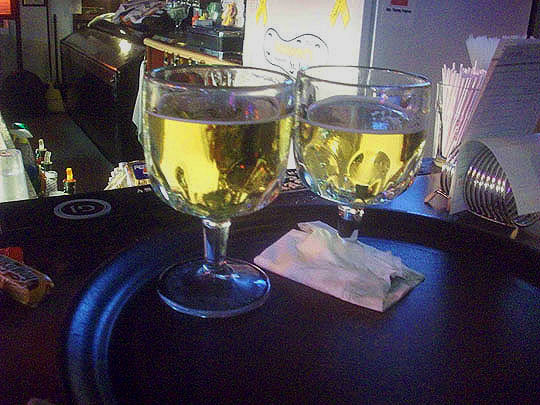 I haven't been in here for years and nothing has changed, let's snag a seat at the bar. Bartender Brad is quick with a beer and a smile, a great bartender and a friendly guy. Here's the view of this no-frills bar from our perch at the watering hole. And more to the right of the bar, next to the wall. 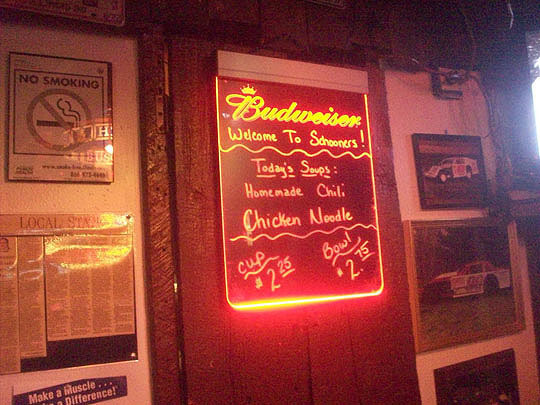 Lights, neon and beer chandeliers hang from the wooden ceiling illuminating the joint. There's more neon over in this corner hanging over some vintage sports jerseys. 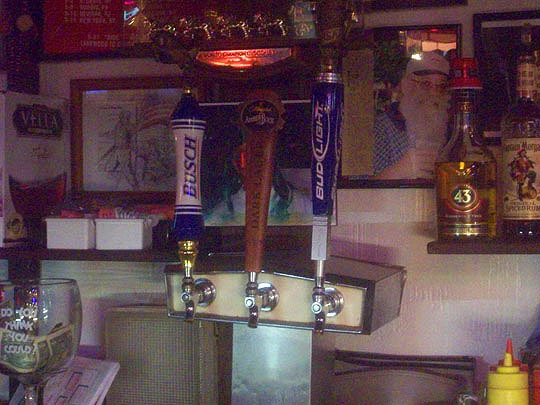 And here's the patent-pending Taps shot for Spike. Ever since Gene made the comment about seeing Amber Bock in every Peoria bar, I've been noticing it too. Here's one of their signs hanging overhead in the wooden rafters. 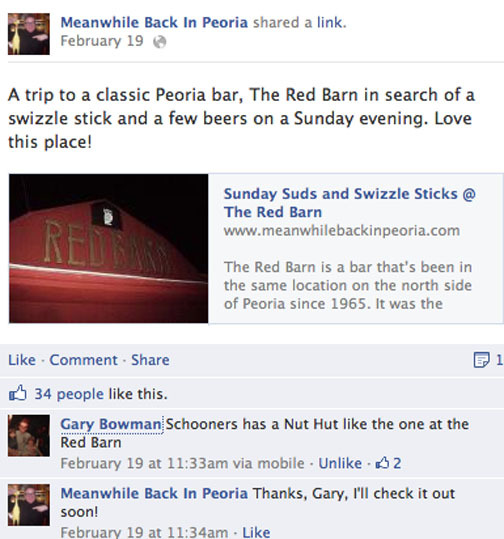 Somebody chimed in and asked if I was the guy who had the Peoria blog and it turned out to be Gary Bowman, who left the comment about the Little Nut Hut on my facecrack page! It's a small world after all! This is Gary's comment that launched this post. It was great to meet Gary in person! Here's Jennifer, the pretty waitress on duty this evening. 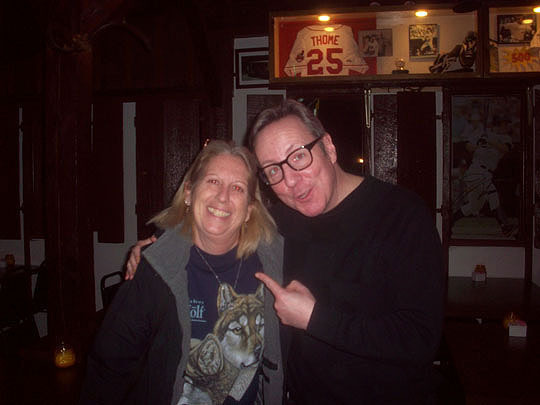 And here's Jennifer with Jim, a Schooner's regular who also visits Mike's Tavern and told me he remembered my Grandpa Seitz from there. It's a small world part II! You know it's a classic Peoria bar if there's a Phil Luciano column hanging on the wall. Danny at the bar caught in a serious moment wondering if I'm ever going to quit wandering around taking photos in here. And I stopped wandering as Brad served up our King Tenderloin. Schooner's is famous for this gargantuan sandwich which could easily feed four people. Danny and I could only eat about half of it, but it was delicious! But no swizzle stick tonight, just a plastic straw. Waah, waah, waah, waah! It's a small world part III: As Danny, Brad and I were discussing swizzle stick, Karen approached the bar and asked if I was the "Peoria blog guy." It turns out she reads this blog and she recognized me, too funny! It was a great night at Schooners and thanks to Danny for the ride and for being this week's guest star! See you all tomorrow! 730 E War Memorial Dr.
Further Reading: Peoria Journal Star, foursquare and Excessive Velocity. I'll be lazing on a Sunday afternoon. Bonus Swizzle Stick From Jaws the Cabbie! I may not get a swizzle stick in a bar, but Jaws the Cabbie comes through with a virtual one every week. Here's this week's, nice work, Jaws, cheers and thanks!